The Su-17 was the result of several attempts to lower the aircraft's stall speed to provide shorter take-off and landing runs. The solution was relatively simple - add variable geometry outer wing panels to reduce the wing sweep for improved low-speed performance, then sweep them back for high-speed operations. While the early Su-17 retained the AL-7F engine, all production Su-17s beginning with the Su-17M (NATO Codename: Fitter C) were fitted with the higher-power AL-21F engine. The Su-17M3 (NATO Codename: Fitter H) was the result of several iterations of improvements over the original Su-17. This variant was based upon the two-seat Su-17UM trainer, but the rear cockpit was replaced with more avionics and internal fuel. The dorsal spine is deeper as well for additional fuel and avionics. The distinctive droop in the forward fuselage came about with forward fuselage stretch that started with the Su-17M2 (NATO Codename: Fitter D). The Su-17M4 (NATO Codename: Fitter K) was the final production variant that featured an improved tactical navigation system as well as other avionics, and is visibly recognizable by the air intake scoop at the base of the vertical stabilizer. The scoop provides the avionics bay with supplemental cooling air for the additional capabilities added over the Su-17M3. 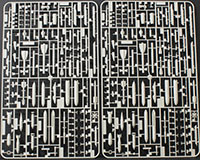 Here's a welcome addition to the Soviet Aviation Quarter-Scale Kit List - this is the Kitty Hawk 1/48 Su-17M3/M4 Fitter kit. 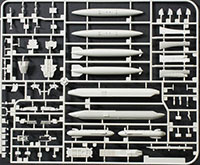 Contrary to the title on the box, this kit builds into your choice of the Su-17M3 Fitter H or Su-17M4 Fitter K. The kit is molded in gray styrene and presented on nine parts trees plus one tree of clear parts and one fret of photo-etched parts. 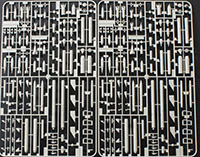 Out of the box, this kit offers more details and options than the only other kit of the subject in this scale - the venerable OEZ/KP tooling, or the various enhanced reboxings of that kit such as those from Eduard and Karaya. This looks like one of Kitty Hawk's best efforts to date and I'm looking forward to seeing how it builds. If the worst issue in this box is simple confusion over the M3 versus M4, then there is no real problems in this kit so far. 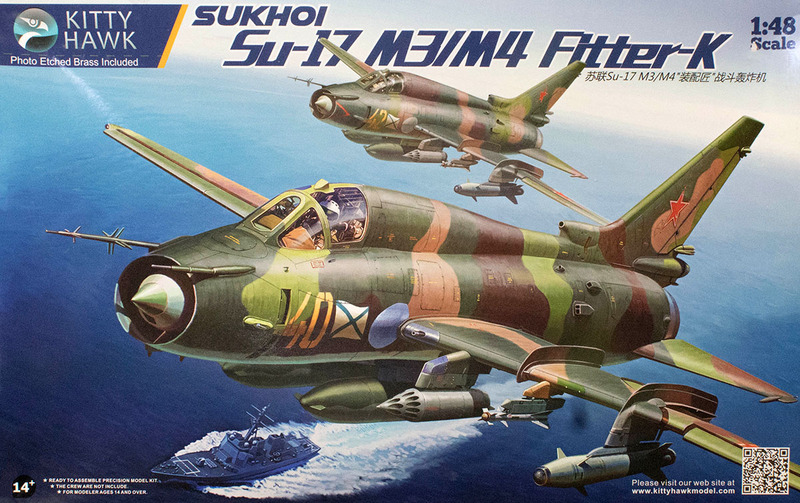 If you're looking for some good references, the 4+ title on the Su-22 will help as will the 'OKB Sukhoi' title by Yefim Gordon, but the best out there is the 'Sukhoi Su-7/Su-17' also by Yefim Gordon.